Richard II was son of Edward the Black Prince, by his wife, Joan, called ‘ The Fair Maid of Kent,’ and was born at Bordeaux, in February, 1366. his father died in 1376, and he was created Prince of Wales ; succeeding his grandfather,Edward III, on the throne, 22nd June, 1377. During his minority the government was carried on by a council of regency, and the state was distracted by the intrigues and contentions of the young king’s uncles, the Dukes of Lancaster (John of Gaunt) and Gloucester. Richard showed no small courage and presence of mind on the outbreak of the insurrection provoked by the poll tax and the scandalous manner in which it was collected ; meeting the insurgents with their leader Wat Tyler, in Smithfield, and persuading them, by promises of full charters of freedom to quit the city. Their chief, however was killed and they were soon dispersed by military force. Before the month (June, 1381) ended, the king revoked the charters had the insurgents tried, and about 1,600 of them put to death. War was going on with France, and the Lollards were rising into importance enough to be persecuted. In 1382 Richard married the Princess Anne of Bohemia, who acquired the title of the ‘good Queen Anne.’ On the departure of the Duke of Lancaster for Spain, in 1386, the king was deprived of power by a council of regency with Gloucester at its head; which, however, was declared by the judges to be illegal. The king assumed the government in May, 1389, made William of Wykeham chancellor, and drove from the court the Duke of Gloucester and his adherents. The queen died in 1194, and the same year Richard visited Ireland. Great agitation arose about the same time in consequence of the spread of John Wickliffe’s doctrines. His writings had been already condemned and seized as heretical. In 1396 the king married Isabella of France, then only seven years of age; and the French war was ended by a truce for twenty-five years, and the surrender of Brest to the Duke of Brittany. The marriage and treaty increased the popular discontent, and Gloucester was encouraged to attempt to regain his power. But he, with several of his accomplices in conspiracy, were seized tried and condemned. The duke was put to death at Calais. The famous quarrel between the Dukes of Hereford and Norfolk took place in 1398 when both were banished by the king. After the death of Lancaster, in the following year, Hereford (now Duke of Lancaster) returned professedly to claim his estates which had been seized by Richard ; he was joined by the Percies and other nobles, and on Richard’s return from Ireland, made him prisoner at Flint, August 20th, and compelled him to resign the crown. Richard was sent to the Tower, then to Pomfret (Pontefract) Castle, where he is commonly said to have been murdered. But nothing is certainly known of his end, and there are strong grounds for believing that he soon escaped from Pomfret and lived in Scotland till 1417 or 1419. 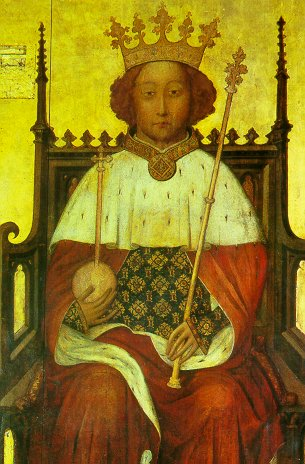 The large life-size portrait of Richard II, which hung originally in Westminster Abbey, and was removed in 1775 to the Jerusalem Chamber, was lent to the National Portrait Exhibition in 1866. It has been since discovered that the genuine portrait was completely hidden by successive re-paintings, and the task of cleaning it has been successfully executed. The real picture, painted in tempera, is in perfect preservation, and is the earliest royal portrait we possess. There is another remarkable portrait of Richard II., a profile in a small diptych in the possession of the Earl of Pembroke at Wilton.